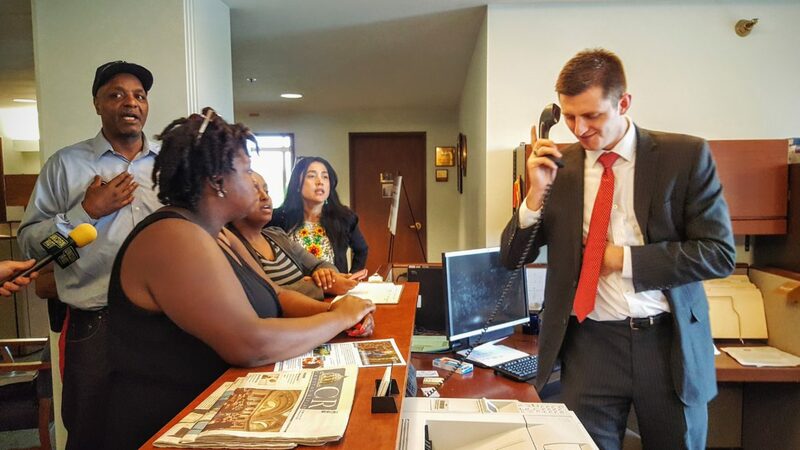 Activists request a meeting with Speaker of the House Rep. Kurt Daudt (R-Springfield) on May 19 to discuss the United Black Legislative Agenda, only to be met with a call to security. Photo by Cirien Saadeh. Following the end of another disappointing legislative session at the state capitol, Minnesota’s communities of color have started to look to the future: the 2016 election and 2017 legislative session. “It’s disappointingly not a surprise that the agenda item addressing the [racial and economic] disparities has not been addressed,” said Steven Belton, president of the Minneapolis Urban League. The 2016 legislative session was characterized by a confluence of many factors: the realization that Minnesota’s communities of color were some of the worst off in the nation, a $900 million surplus, a split legislature unable or unwilling to negotiate, and increased engagement and advocacy by African American and East African community groups. As the legislative session comes to an end, many of these groups are looking forward. “You had all these groups organizing around racial equity at a moment when it is so important and there seemed to be so much momentum behind it, at least the rhetoric was there. And yet, nothing happened,” said Brett Grant, director of Policy and Research with Voices for Racial Justice. An April 2016 report from the Metropolitan Council announced that race and ethnicity were at the center of the disparities between Minnesota’s white and Black communities, something which did not surprise Minnesota’s communities of color. According to that report, even if white and Black communities had similar socio-economic characteristics, Black communities would still have lower rates of employment, homeownership and hourly wage. At the beginning of the year, Gov. Mark Dayton had presented a supplemental budget which included $100 million aimed towards decreasing Minnesota’s racial and economic disparities. The state Senate Subcommittee on Equity, newly formed this year, proposed $91 million towards that same goal. House Republicans proposed nearly $27 million, though their target was to spend nothing. By the end of session, $35 million had been included in the supplemental budget and sent to Dayton, although the governor has yet to sign the bill. Many of the efforts put forth by communities of color, however, such as those pertaining to urban agriculture or drivers licenses for undocumented immigrants, did not make it out of committee. “They missed the boat on felon re-enfranchisement, they missed the boat on driver’s licenses for all, there was a lot of economic assistance packages to different community organizations that they missed the boat on. And while there was some good wins that are really tangible and really good wins for communities, this legislature could have done so much more,” said David Gilbert-Pederson, legislative researcher with Voices for Racial Justice. Pederson also notes that the lack of legislative action on racial equity bills this year was in spite of the high levels of engagement by communities of color. 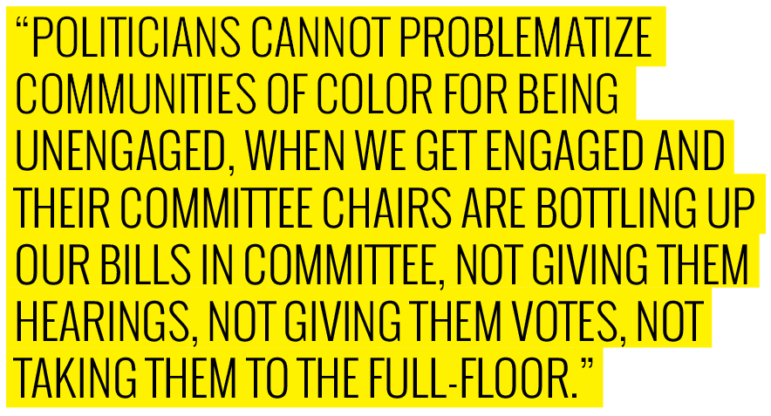 “Politicians cannot problematize communities of color for being unengaged, when we get engaged and their committee chairs are bottling up our bills in committee, not giving them hearings, not giving them votes, not taking them to the full-floor,” Pederson said. Pederson pointed to the felon re-enfranchisement amendment as an example, which was offered on the omnibus elections & voting bill, but was then ruled ungermane. “At the Fourth Precinct, a lot of groups like the [Minneapolis] Urban League and Black Lives Matter were disagreeing on the tactics, but we agreed on the final vision which is to address the inequities in the state,” said Wintana Melekin, civic and political engagement director with NOC. Thus, the United Black Legislative Agenda was born. The UBLA is organized around the priorities and visions its authors could all agree on, Melekin noted. They were all free, however, to also pursue their own priorities outside of the UBLA. According to Hassan, Melekin and others, they will continue to organize around the UBLA in next year’s legislative session. Despite the efforts of these and other African American organizations, however, little was successfully done this legislative session in terms of decreasing Minnesota’s racial and economic disparities. “Certainly, there was some symbolic change. The African American groups and organizations coming together to present the United Black Legislative Agenda, that certainly was a success. But in terms of tangible outcomes, I’m not aware of any,” said Hassan. The United Black Legislative Agenda is one example of the united and coordinated effort put forth by communities of color during this past legislative session. And while engagement by communities of color in the legislative session is not new, in many ways this year’s effort was unprecedented. “What we’re observing is something different than anything that has ever taken place before,” Hassan said. Bruce Corrie, a professor of economics at Concordia University-St. Paul, argues that this year’s legislative session can be characterized by the high levels of engagement by some communities of color and the strong partnerships with legislators, but also missing communities of color, including the Asian American and Pacific Islander communities. “How do we come up with an equity plan that better represents Minnesota and its communities of color?” Corrie asked. However, others argue that African American communities face their own unique problems and challenges and, therefore, require solutions unique to their communities. “I think that the work that is being done by Black people towards addressing the economic disparities is unapologetically and appropriately about focusing on Black people. Black people have the worst disparities. It is not the same for Asians. It is not the same for Latinos. And it is not to say that these other groups don’t have their problems or their challenges, and it’s not to say their concerns are not important. It’s not even about ranking ours. It is to say, if you look at the data, Black disparities are the worst,” Belton said. Dayton has yet to announce whether or not the Minnesota Legislature will be holding a special session, since legislators were unable to pass a bonding bill or a transportation bill. Regardless of whether or not there is a special session, however, many of the organizations and community leaders active during this past legislative session are looking to the next election and the legislative session as they plan to continue pushing forward the policies and legislation that did not pass this year. “We will begin work on our 2017 legislative agenda almost immediately,” said Belton. This is echoed by Michelle Horovitz, executive director and co-founder of Appetite for Change. Horovitz said Appetite for Change has plans to start preparing earlier for the next legislative session; they also plan to dedicate more resources, including possibly hiring a policy-focused staff member. Appetite for Change legislative priorities for next year include urban agriculture and working to bring in more funding for the Good Food Access Fund, which received $250,000 of a requested $10 million during this legislative session. “I think there is a need for dedicated lobbyists working on behalf of communities of color,” said Horovitz. Horovitz also notes that there is a need for 501c3 non-profit organizations to better understand the role they can play in advocacy work. Michael Chaney is founder and executive director of Project Sweetie Pie. Chaney says his organization has plans to continue working to push legislation at the State Capitol alongside their work across North Minneapolis. “I am not daunted by it. I am not disillusioned by it. I am not angered. I just know what it has taken 150 years to undo, it may take 150 years to re-establish local food systems, urban farming. I’ll just keep on doing what it is that we do” Chaney said. 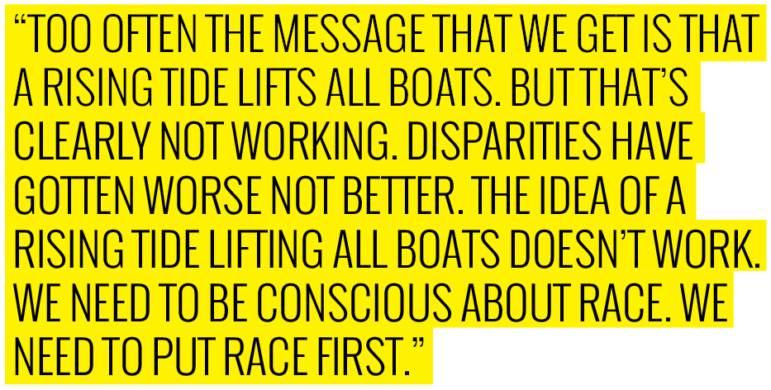 Pederson, a community organizer of ten years, recommends that leaders and organizations use a variety of strategies and tactics to move forward racial equity in Minnesota and intentionally put race at the center of efforts to transform Minnesota. Some more excellent reporting by Cirien Saadeh! Thanks it is much appreciated.